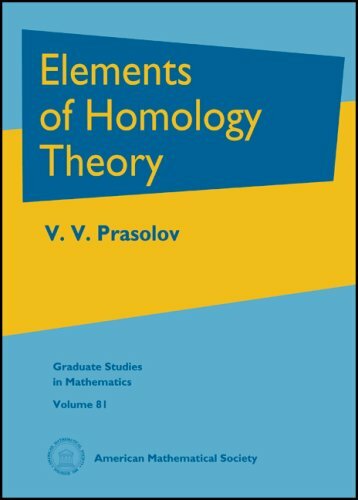 [PDF] Elements of Homology Theory (Graduate Studies in Mathematics) | Free eBooks Download - EBOOKEE! Description: The book is a continuation of the previous book by the author (Elements of Combinatorial and Differential Topology, Graduate Studies in Mathematics, Volume 74, American Mathematical Society, 2006). It starts with the definition of simplicial homology and cohomology, with many examples and applications. Then the Kolmogorov-Alexander multiplication in cohomology is introduced. A significant part of the book is devoted to applications of simplicial homology and cohomology to obstruction theory, in particular, to characteristic classes of vector bundles. The later chapters are concerned with singular homology and cohomology, and Cech and de Rham cohomology. The book ends with various applications of homology to the topology of manifolds, some of which might be of interest to experts in the area. The book contains many problems almost all of them are provided with hints or complete solutions. No comments for "[PDF] Elements of Homology Theory (Graduate Studies in Mathematics)".